EAT: Vegan Nikuman. / papillon. Oh my darling clementines, have I got a treat for YOU. 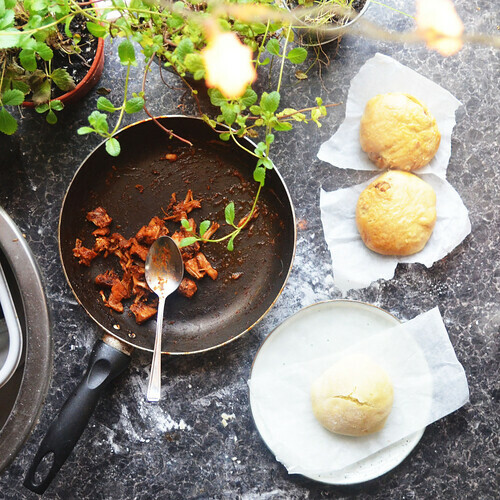 Some of you might remember when this happened; that time I got super excited about steamed bao buns and filled them with… everything. Pretty much everything. Like, everything! …except I guess the one thing they’re usually filled with: pork. I figured (WHAT A CHILD I WAS) you couldn’t actually make vegan pork. I mean, maybe (SO NAIVE) if you were a food scientist or something? Or like, you could do something (YOU KNEW NOTHING, JON SNOW) with seitan or tempeh to get a sort of, vague equivalent. Probably if you lived somewhere where veganism actually existed - i.e. not Japan - there were companies figuring this stuff out, and inevitably (I BELIEVED, IN MY YOUTH) charging a fortune for it. Well, probably also yes on some of that. But more importantly, no. Somehow, it’s taken me this long to discover jackfruit ‘pulled pork’. 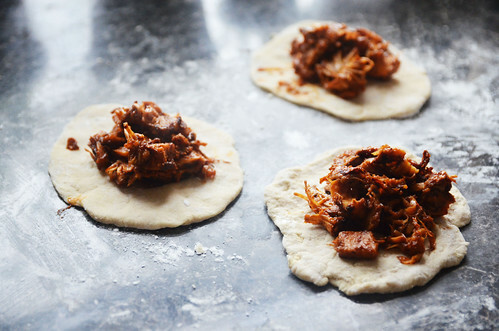 Essentially: when cooked in BBQ sauce and spices, jackfruit - that big ugly lookin’ green thing - becomes an uncanny meat replacement, taking on whatever flavours it’s cooked with and the texture of pulled pork. 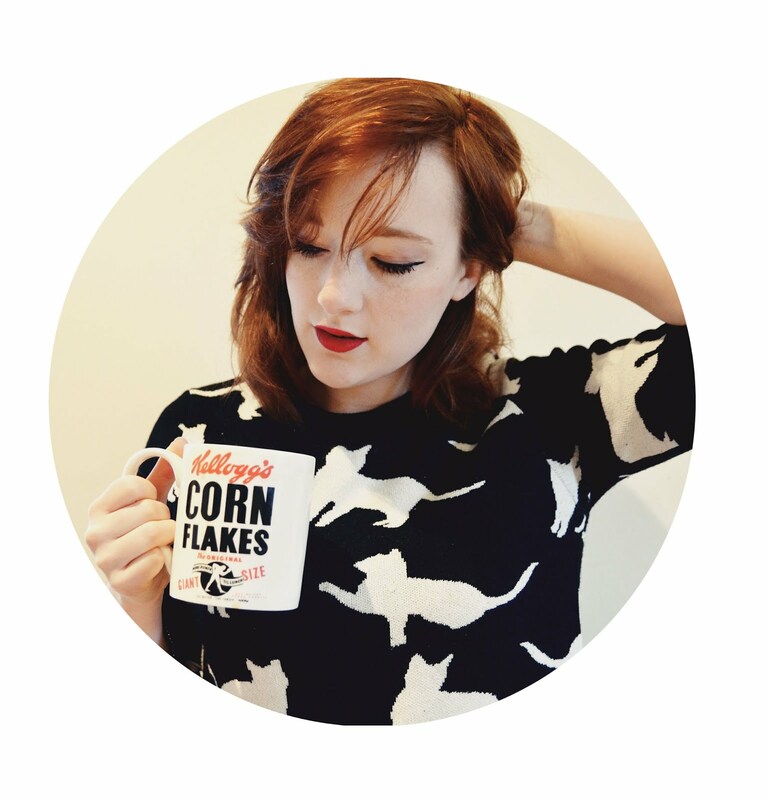 It’s like, a whole Thing, which makes me feel like a nerd for only hearing about it on Instagram recently. I’m not even a cool vegan. Disaster. Completely unqualified. Whatever. I knew immediately I needed to steam some buns. Minds out of the gutter, please. I used the instructions given here by the Minimalist Baker. My first batch didn’t quite have the umami flavour - the savouryness - that I’d hoped for, because I think I was a little light on the seasonings. Second time around, I added a generous splash of dark soy sauce on top of everything else listed, and it made a difference. Combine the first four ingredients together in a large mixing bowl and let stand for 30 mins. Add the rest of the dough ingredients to the bowl and knead until elastic – you may need a touch more flour, but you don’t want it to be falling apart, it should all combine together after a bit of violence. Leave to rise until it has tripled in size – I filled a huge wok with hot water and put my mixing bowl in that to keep it warm (covered with plastic wrap), and it took perhaps 1 ½ hours to triple in size. Generously flour your surface - I was tipped off to use cornflour, which made the dough very easy to handle - then turn the dough out onto it and knead for about five minutes. For the pork bao, I split this dough into eight equal balls - a bit bigger than the sweet ones I’ve made in the past. One at a time, flatten the ball into a rough circle and put a tablespoon or two of the BBQ jackfruit filling in the centre. As you can see, I was very generous with the filling, because that’s what I like. 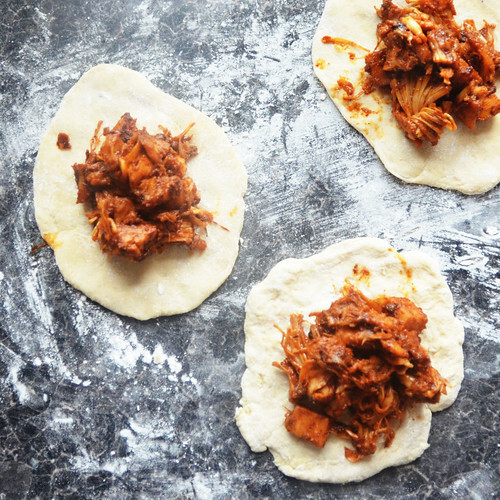 If you want a thicker, pillowier bun, use less jackfruit. You’ll have some filling left over anyway, so don’t try to use it all. Pinch the edges firmly shut, and place the ball seam side down on a little square of baking paper. Repeat for each bun. 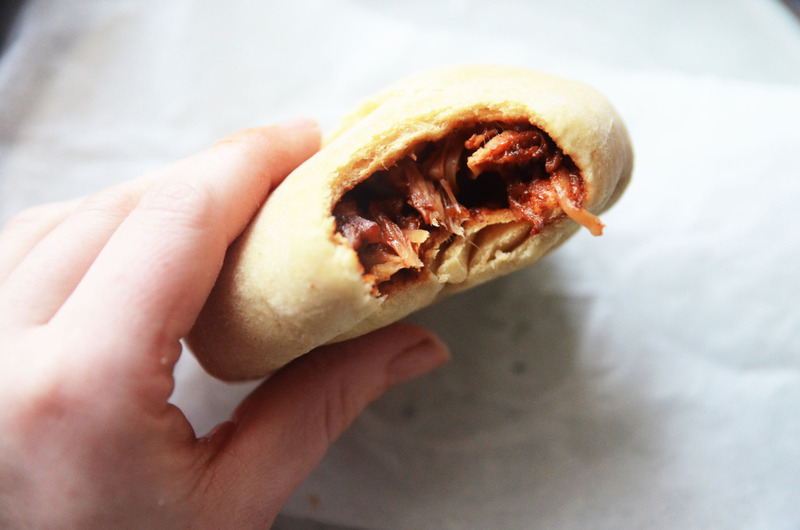 In the past I’ve steamed bao in a microwave steamer, with great success. In the interests of quality testing, I tried both microwave steaming and steaming the traditional way over a pan of water - if you add a spoonful of vinegar to the steaming water, apparently the buns will stay brighter white. This… did not work at all for me, and in fact the yellower buns you can see up at the top were the ones steamed over a pan. Maybe if I’d had a bamboo steamer, I’d get a different result, but, like, LIFE HACK: two minutes in the microwave, guys. Quickest and easiest thing in the world. Eat hot and fresh. Hell yeah hell yeah!